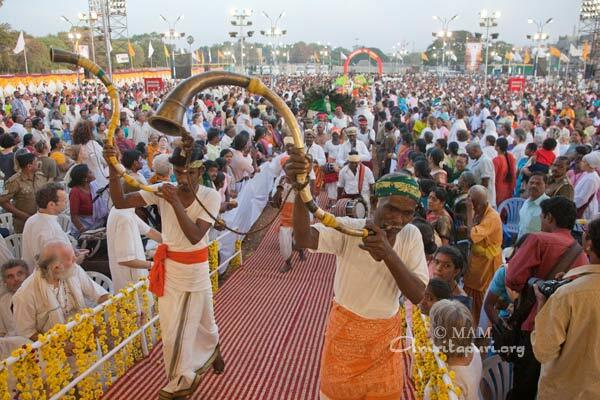 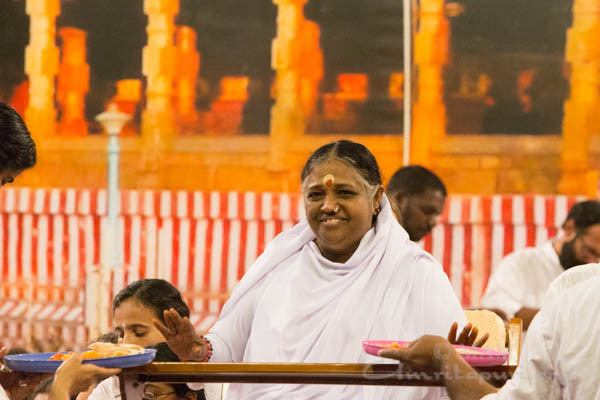 Amma held two days of Brahmasthanam festival activities at her Madurai ashram. 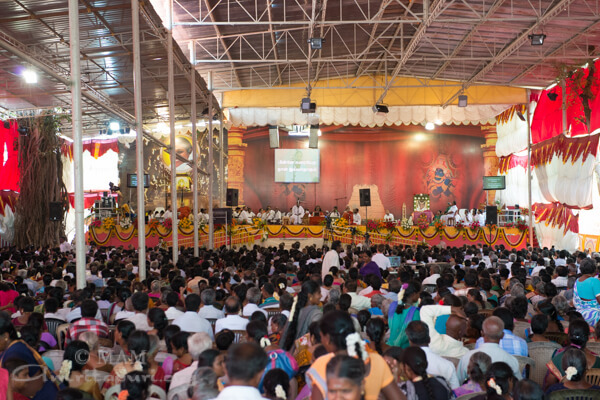 The 2018 Bharata Yatra marks the 23rd anniversary of the Madurai Brahmasthanam temple’s consecration. 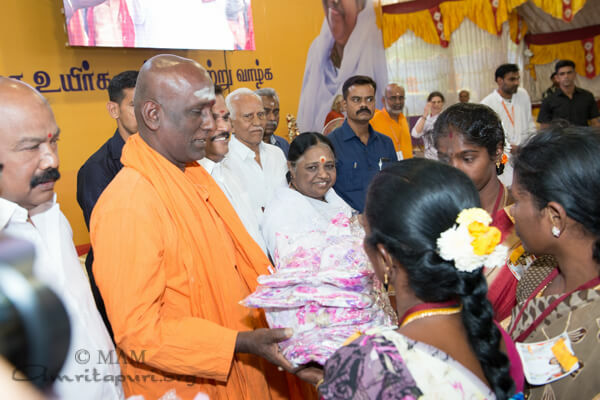 To show her thanks to the city of Madurai, Amma distributed 1,000 sarees to the 25 leaders of the AmritaSree Self-Help Groups that operate in and around the city. 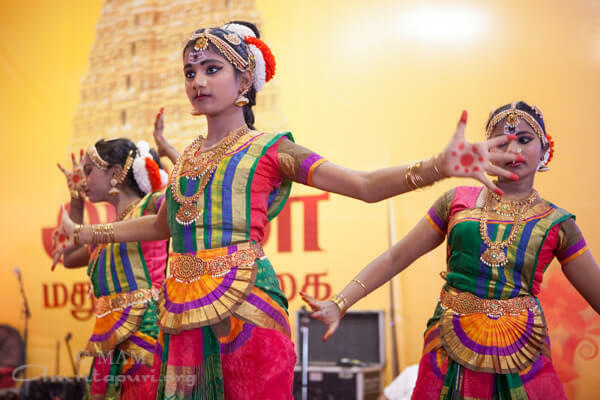 As well, Amrita Vidyalayam students presented various cultural programs. 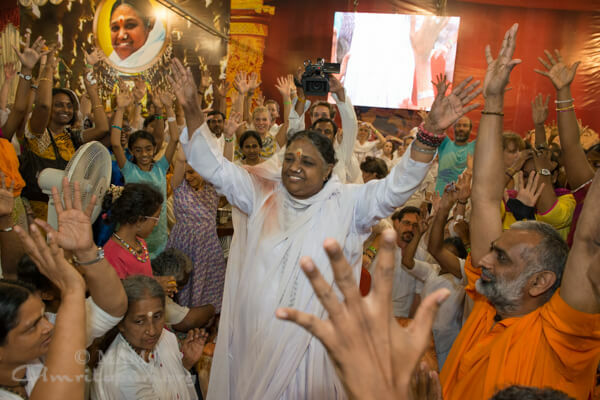 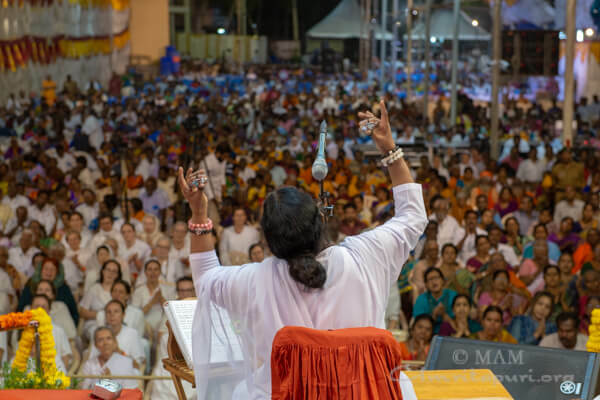 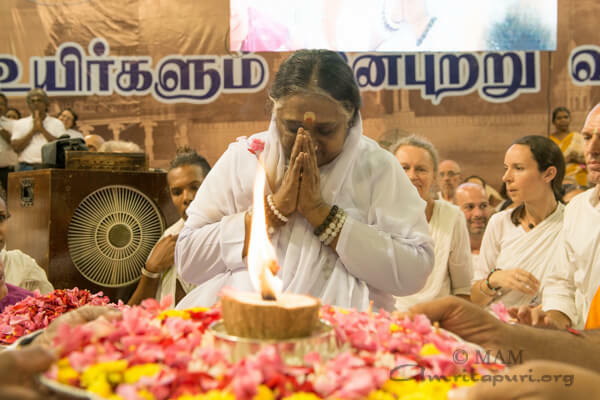 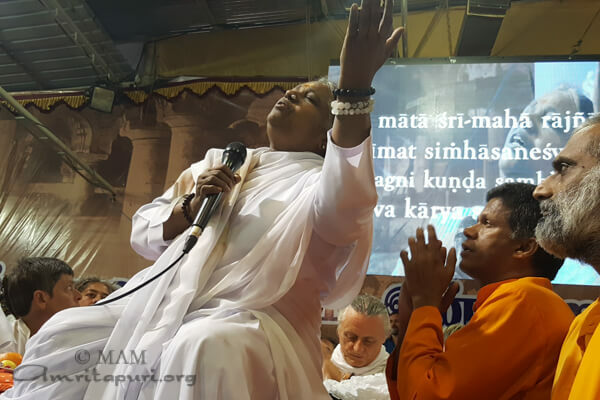 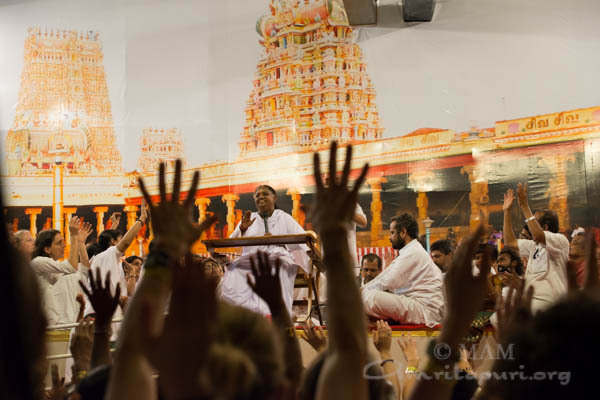 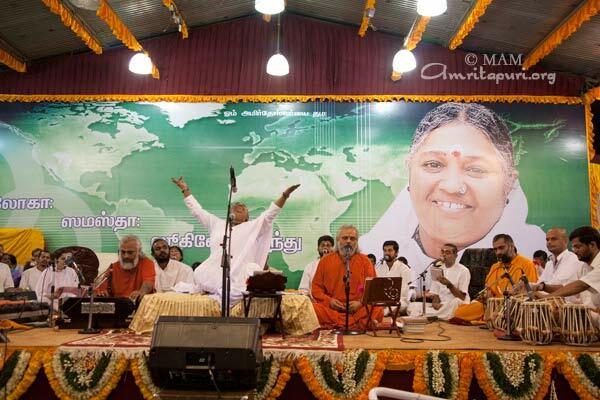 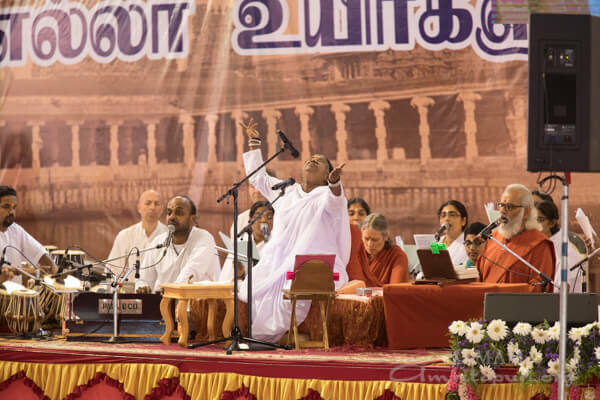 Both days of the program began with Amma leading the crowd in a set of bhajans, a ManasaPuja for world peace, and a guided meditation, all the instructions of which were given in Tamil, the local language. 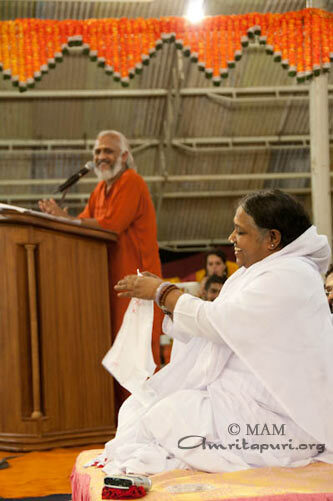 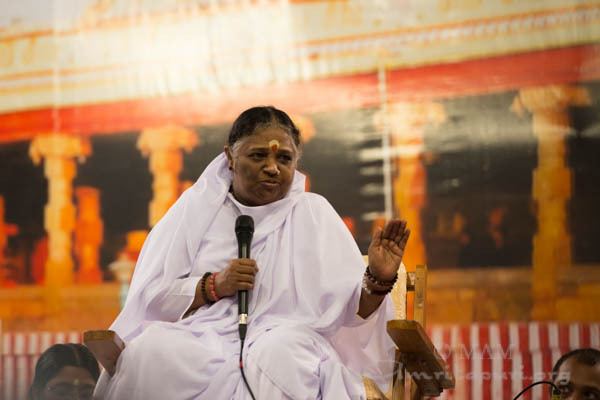 “Amma said Mandara’s example in the satsang to highlight the impact of dhussanga – bad company. 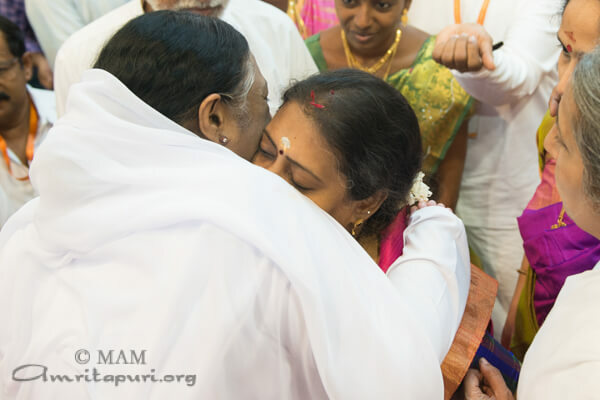 Amma doesn’t refute your point of view.” So saying Amma showed thumbs up to her, lavished kisses on her cheeks. 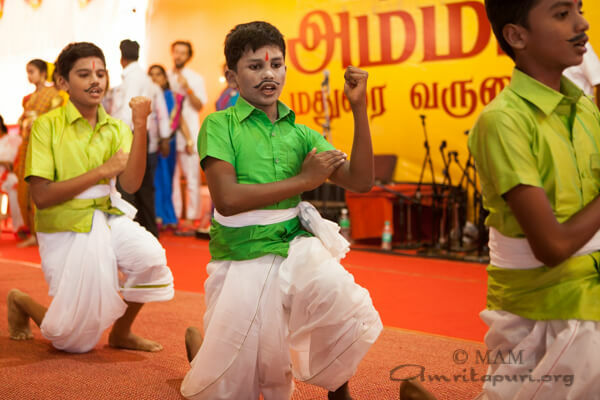 Needless to say, the kid was filled with boundless joy and delight. 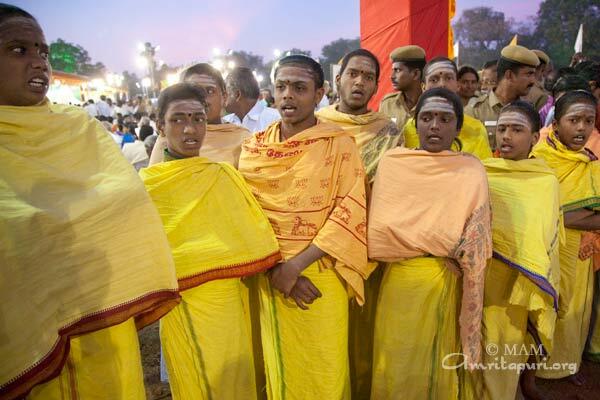 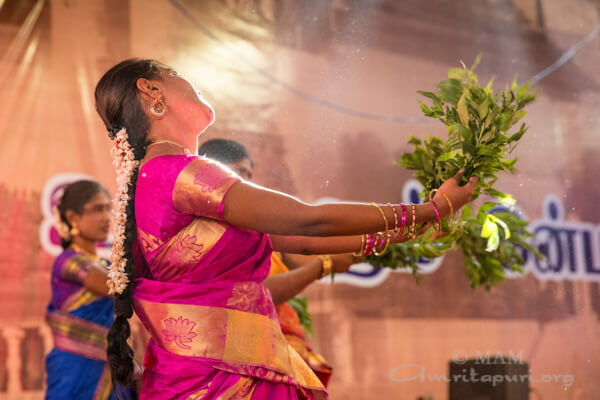 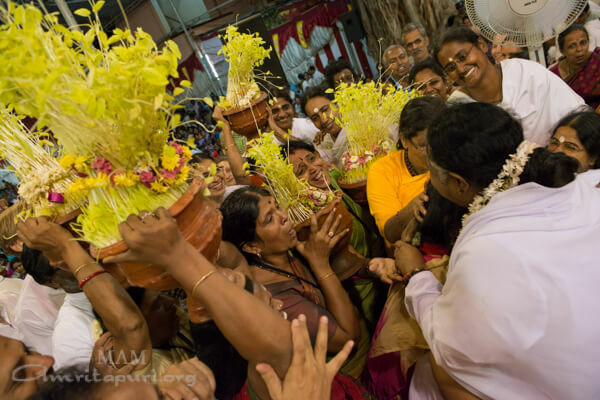 Over the many years Amma has visited Madurai, it has become a tradition for the devotees to bring ‘mulapari.’ This year was no exception, they came with the sprout on their head and the ‘ululooing.’ They also danced around keeping all the pots in sync. 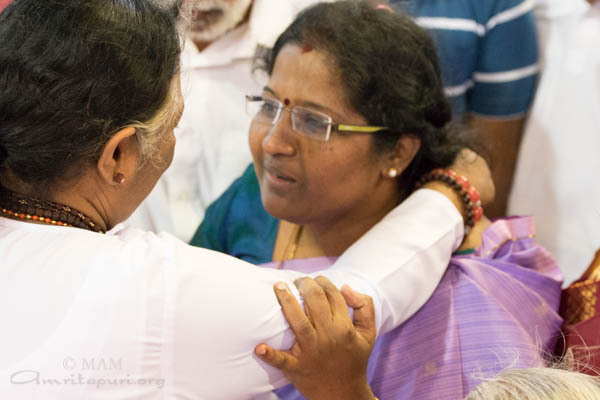 At the close of two long days spent giving thousands upon thousands of embraces, Amma got up from her seat and danced to the tune of Badugas, which brought a departing smile to the faces of all the Madurai devotees who were sad to see her go. 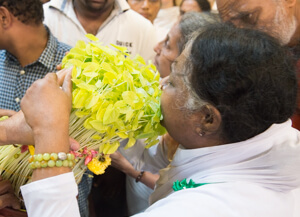 Amma held two days of programmes at the Madurai Ashram and Brahmasthanam Temple. 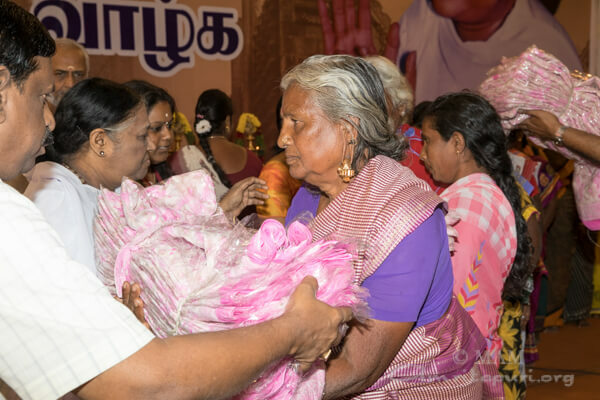 Amma led the Manasa puja in Tamil for the benefit of the devotees there, and distributed new saris for members of the AmritaSree Self-help Groups in the area. 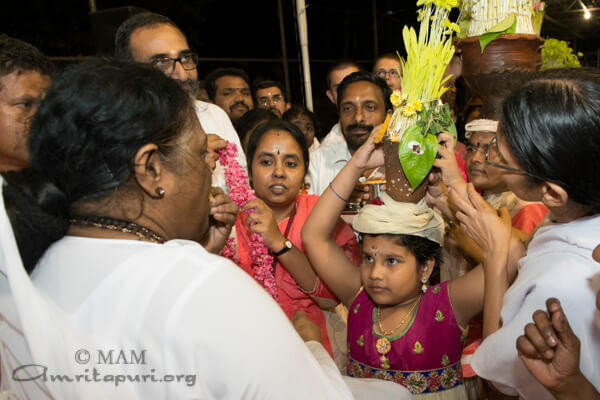 Devotees brought hundreds of traditional ‘Mulapari’ offerings to Amma.They had undergone a 9-day fast and performed a special ritual that involved the sprouting of seedlings in mud pots (Mulapari). 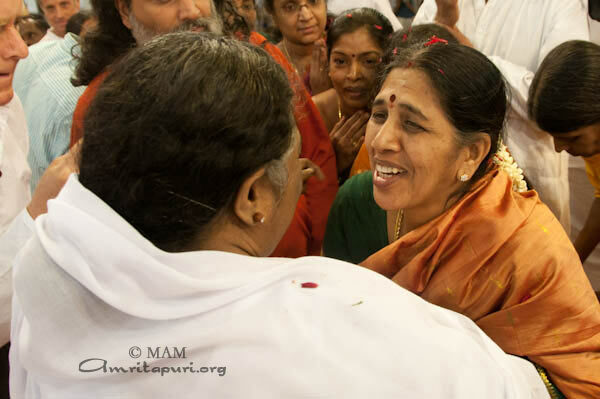 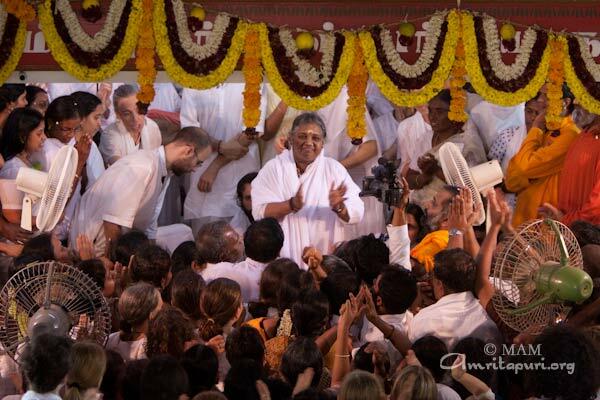 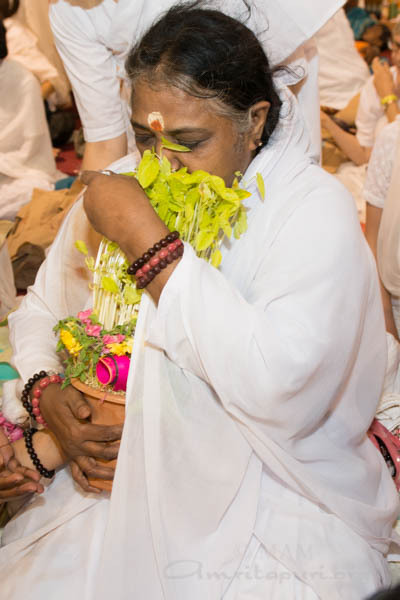 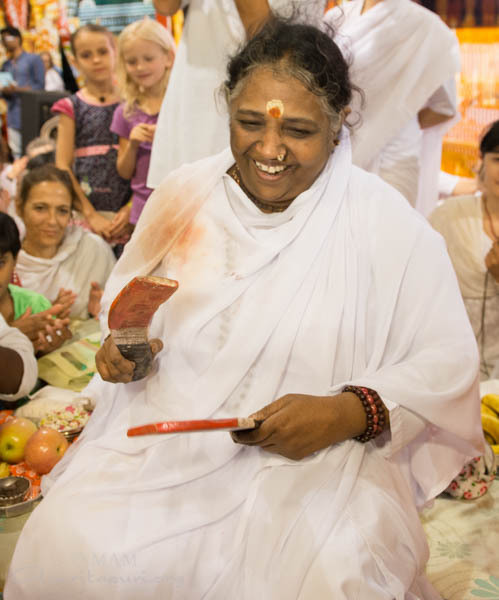 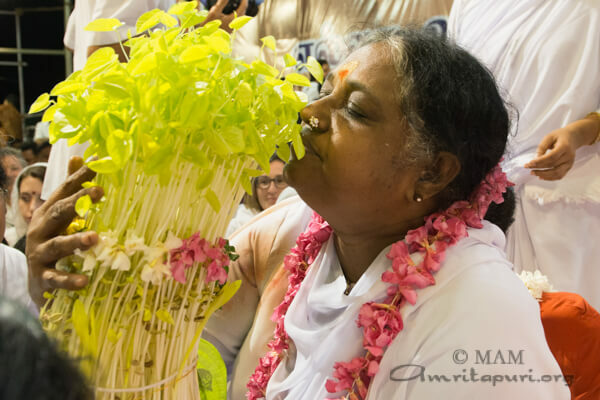 Amma humbly accepted each one, embracing and kissing both the offering and the one who brought it. 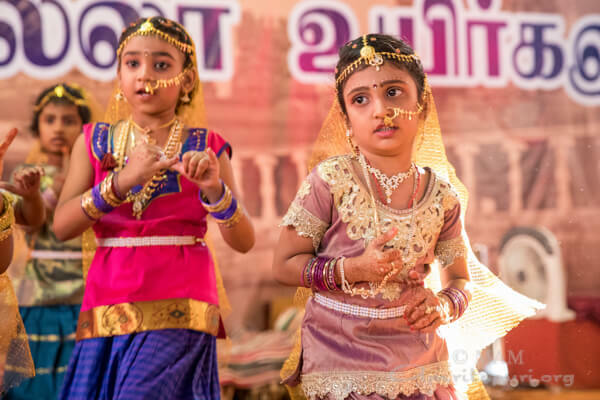 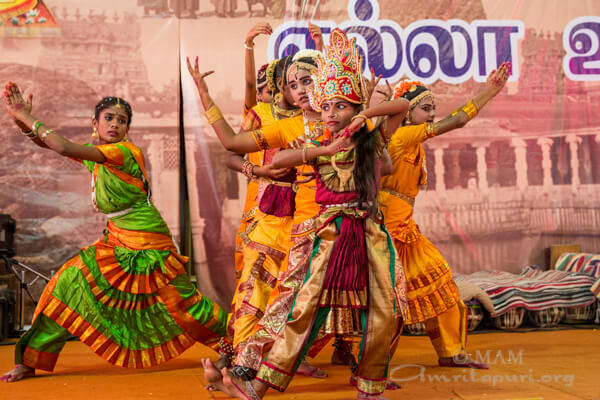 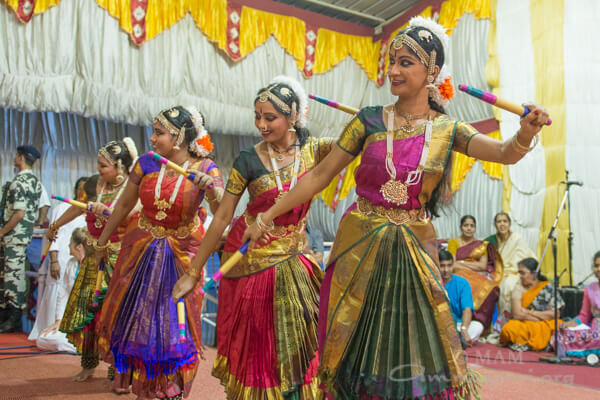 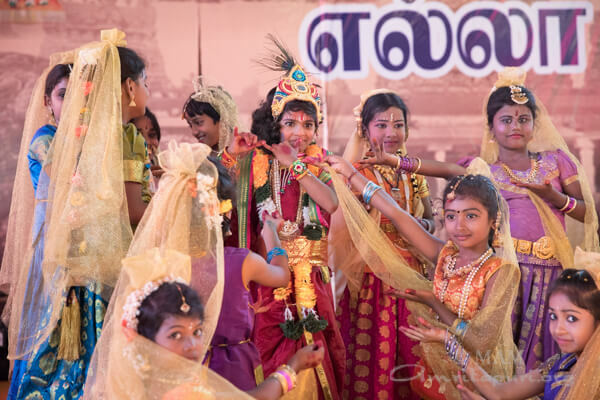 During Amma’s darshan, Amrita Vidyalayam children presented different cultural programs. 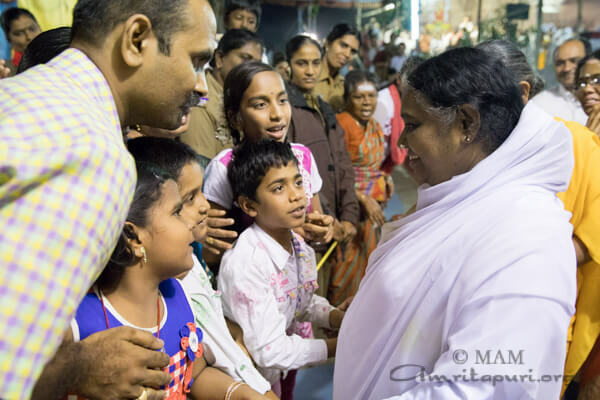 At the end of two days of darshan, just before Amma left the stage, her children in Madurai had one more request for her: to sing Amma Amma Taye with them. 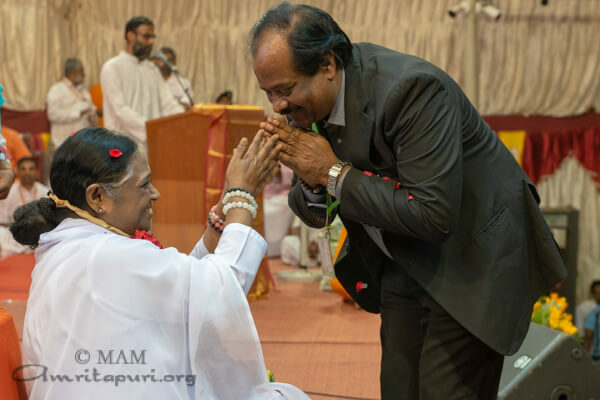 As Amma sang, the devotees were transported to another plane, their hearts’ desire having been granted in their last moments with Amma. 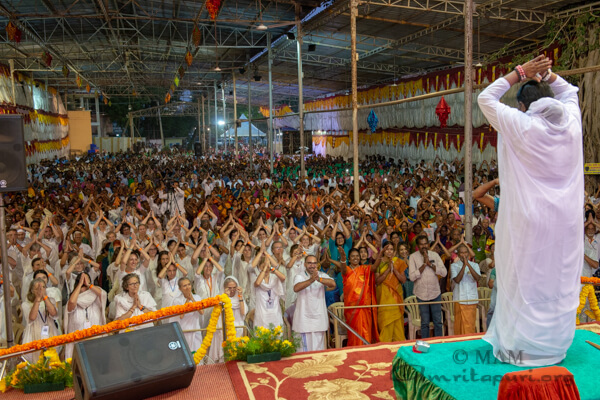 And as Amma sang to the Divine Mother, and the devotees sang to Devi embodied in their very own Amma, Amma and her children were united in divine bliss. 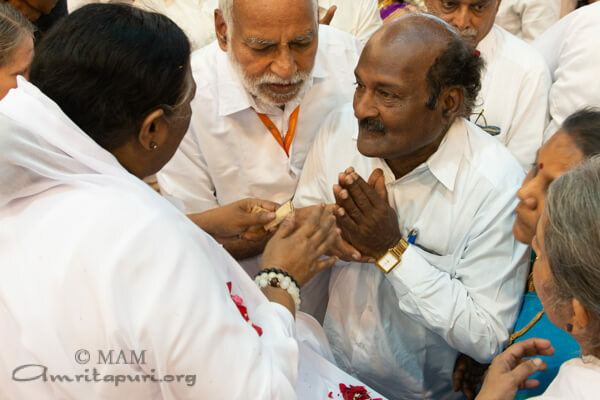 And thus the devotees of Madurai were left with another precious memory to sustain their bond with Amma as they assimilate her message of love and service, carrying it with them in every moment of their lives. 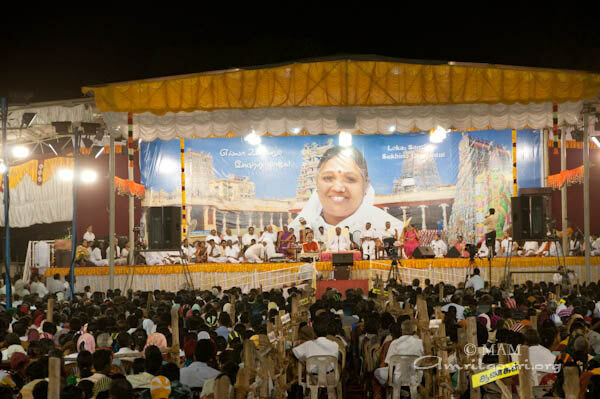 After the Devakottai public program, Amma held a one day program, celebrating her 21st Brahmasthanam festival in Madurai. 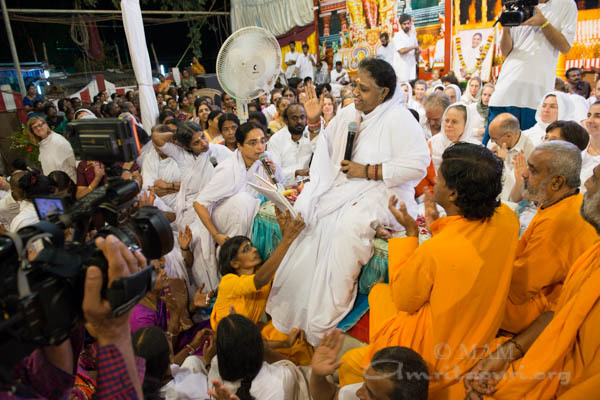 Soon upon her arrival to the city, Amma served a prasad dinner and sang several bhajans with the devotees and the tour group. 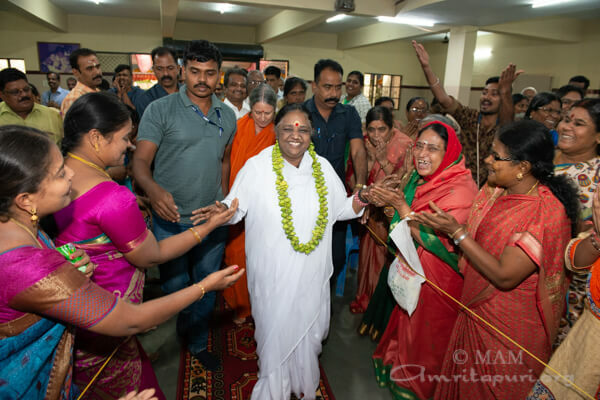 The next morning Amma came back to the stage and gave satsang sang bhajans and guided everyone in mediation and Manasa puja. 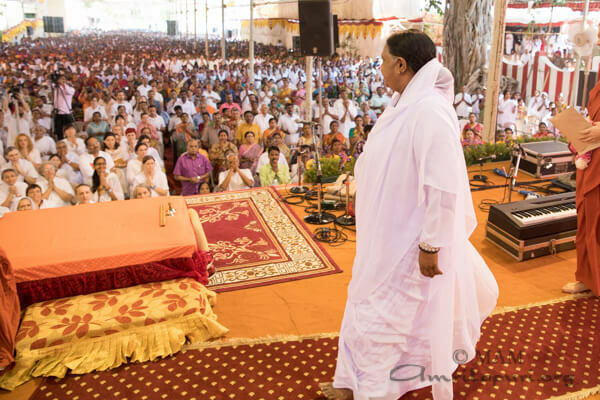 Addressing the devotees, Amma said “It is only natural to make mistakes, but the actions we perform out of anger and impatience can haunt us for the rest of our lives. 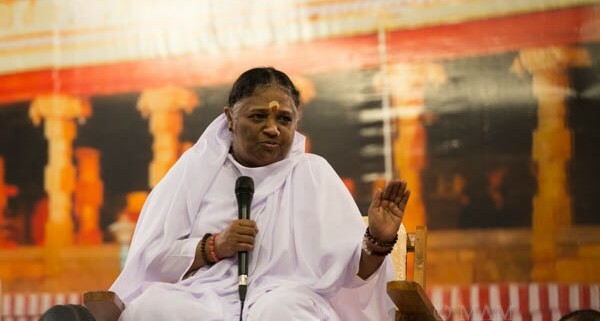 So, when we get angry, before we impulsively say or do anything, we should take a moment to ask our conscience, “Is what I’m about to say or do right or wrong?” If it is wrong, we should immediately drop the idea. 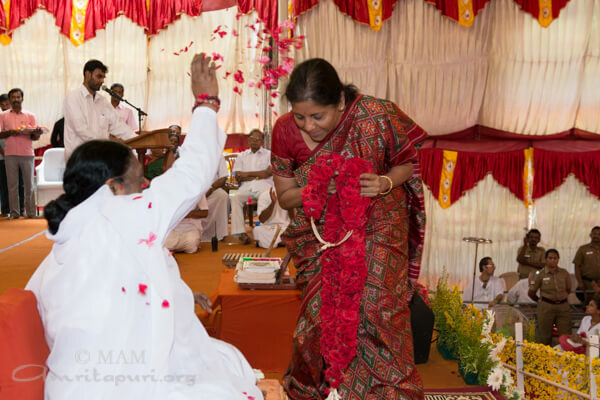 Union Commerce Minister Nirmala Sitharam, welcomed Amma to Madurai saying, “Amma doesn’t stop just by giving lectures. 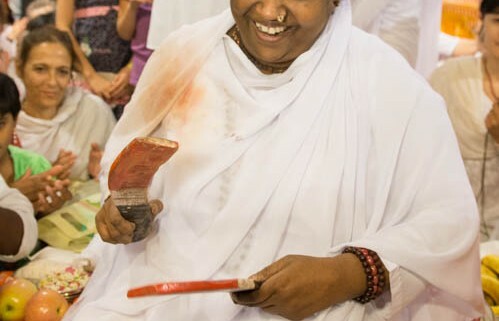 Along with teachings, she does seva as well. 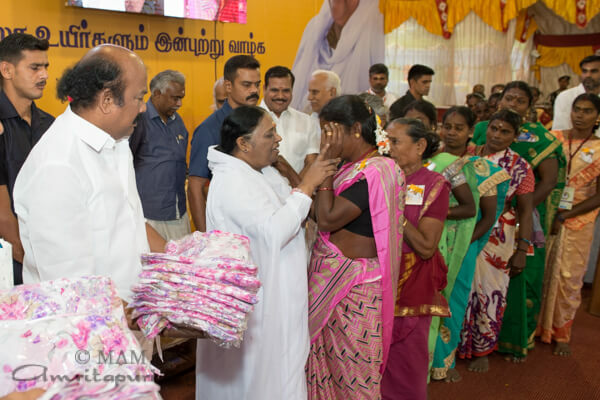 Amma builds free houses to the poor, gives free medical care to the needy. 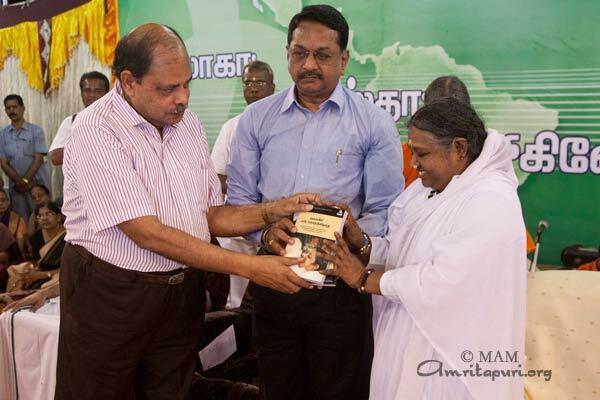 Also she contributes for free education. 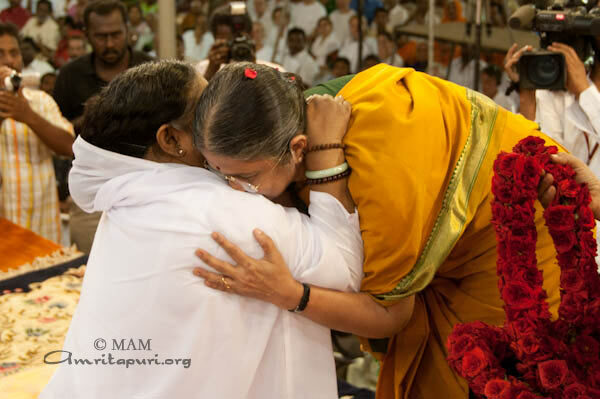 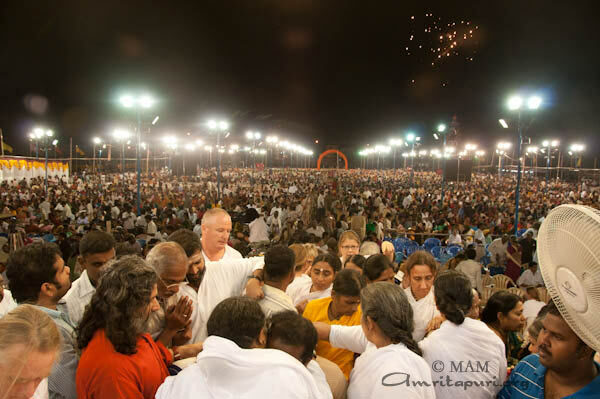 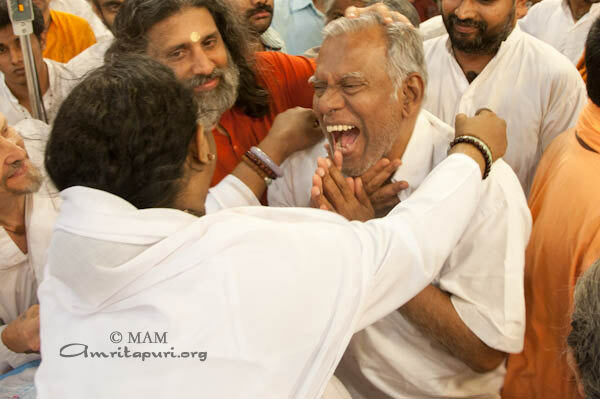 All these forms of help, come from Amma…Amma embraces all of us as her children. 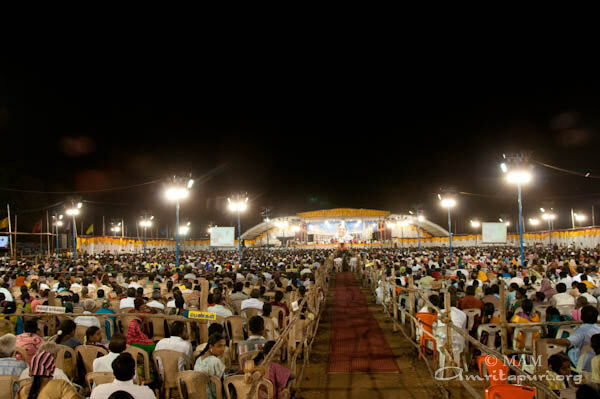 Each of us have got a duty. 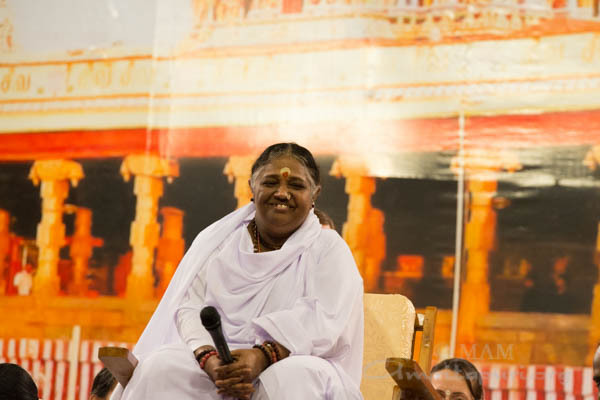 We need to spread her message to those around us. 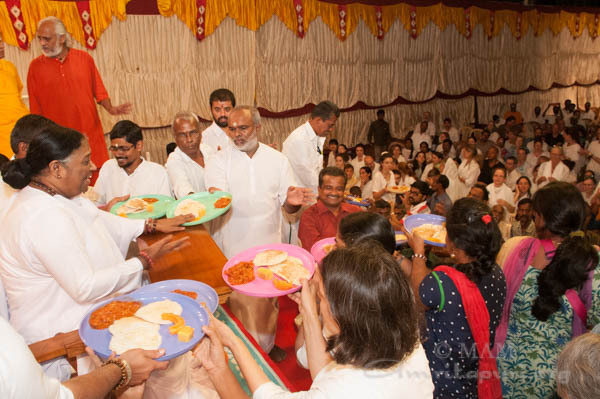 Also we need to imbibe the seva attitude from Amma. 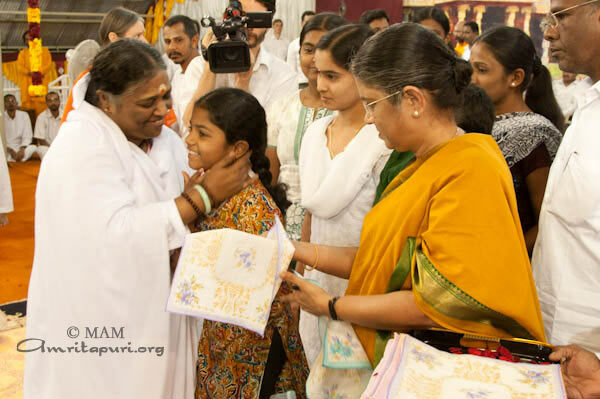 Along with helping our family, we need to offer some service to those around us as well. 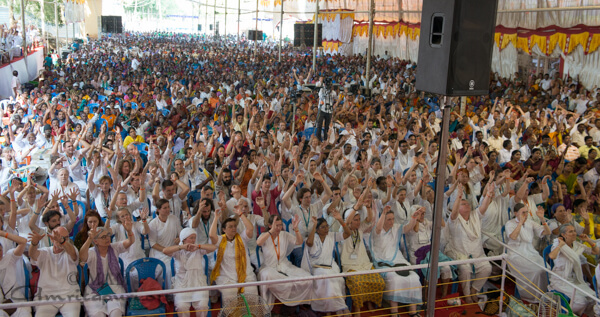 Today, so many divisive forces are trying to divide the nation into pieces. 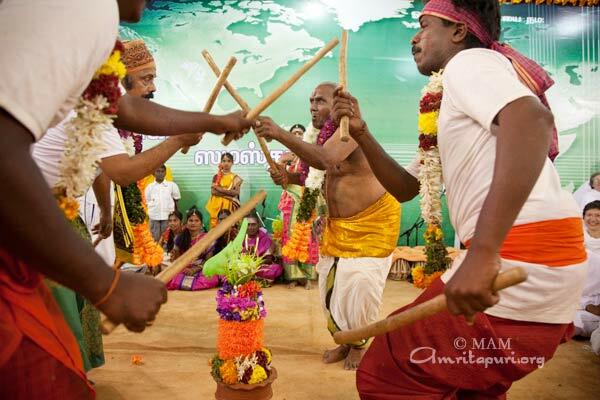 It is easier to fight an external enemy. 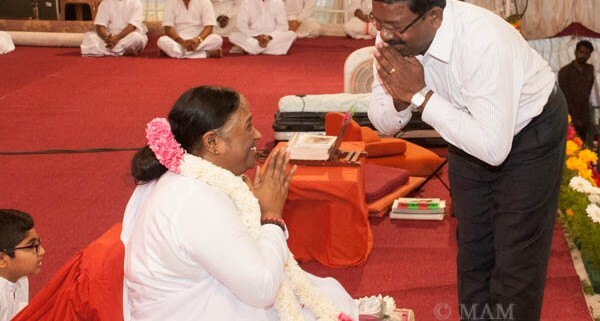 But, we have enemies amongst us. 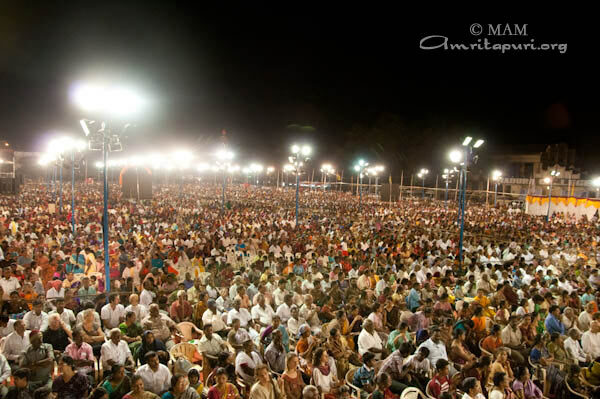 It is not easier to tackle such enemies. 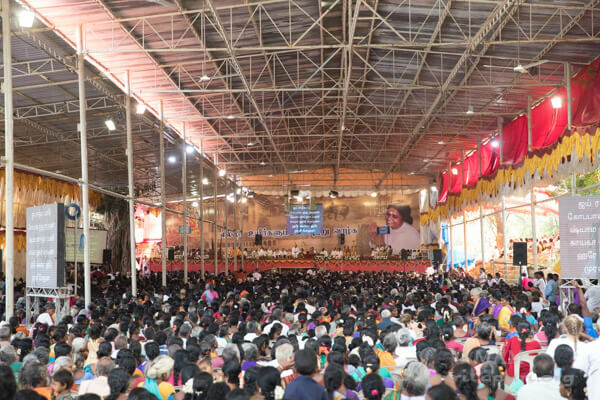 In this nation, we have beings like Amma who have built this nation by doing lot of sacrifices.” She concluded her address by pleading to the the devotees to try to inculcate moral values to their children, build up love for nation and share Amma’s teachings with them. 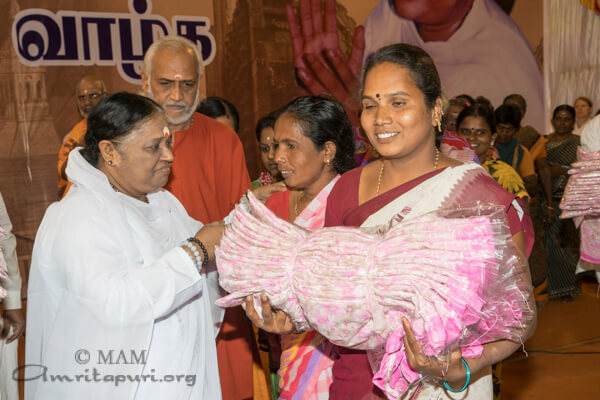 As in the previous years, devotees brought ‘Mulapari’ (pots of 9 different sprouted grains) to offer to Amma during darshan. 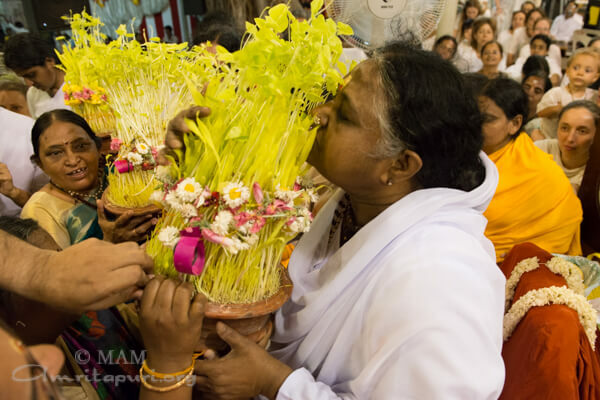 The devotees who prepare these pots, do daily prayers and observe certain practices like sleeping on the floor, and only eating after chanting certain mantras for seven days. 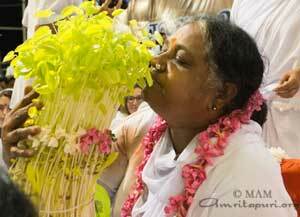 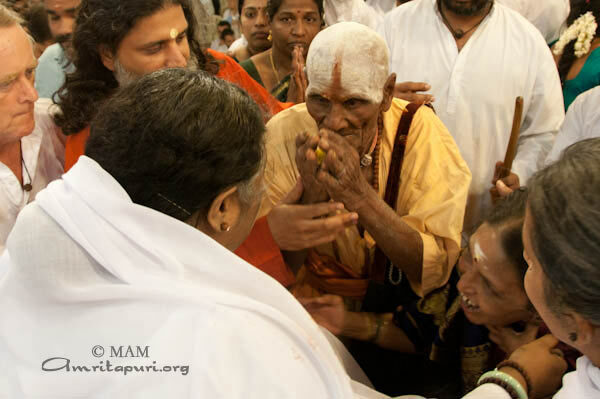 When they came to Amma, both the devotee and the pot were given a loving darshan, with each plant getting loving kisses. 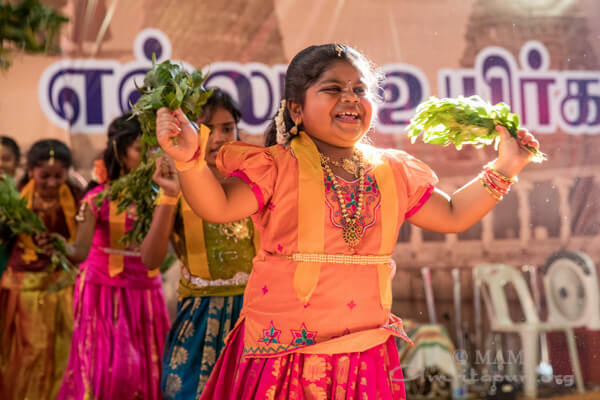 Two of the pots were filled with ‘Ma Vilakku’ a sweet mixture of rice powder and jaggery with with a lit ghee lamp inside of it which is sign of thanks giving for fulfilling one’s wishes. 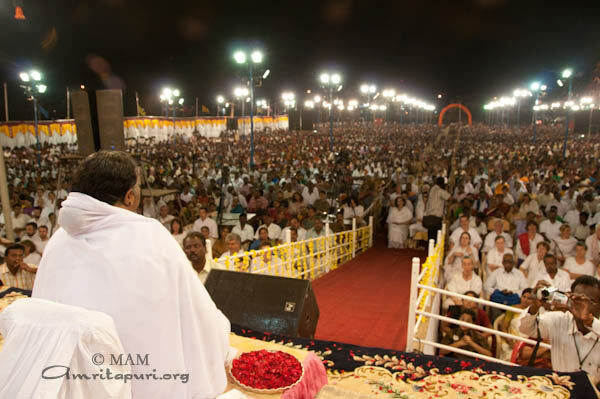 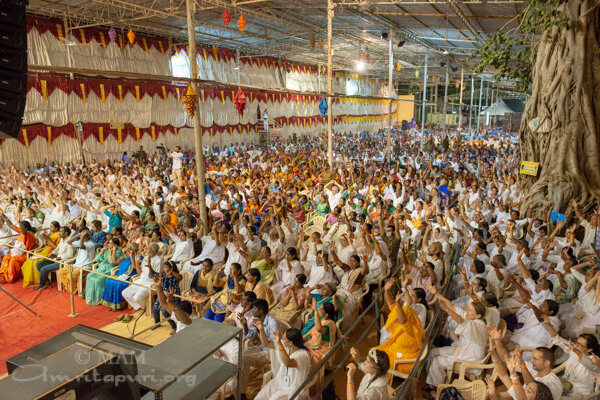 Amma finished the darshan around 1:15 in the morning the following day, 14 hours after coming to the stage. 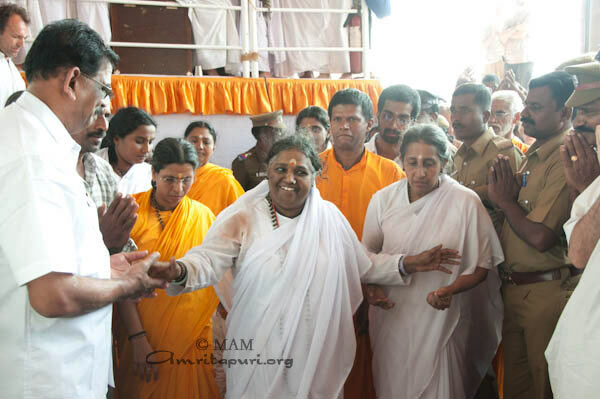 Immediately after she finished, Amma and the tour group left for the next program in Kanyakumari. 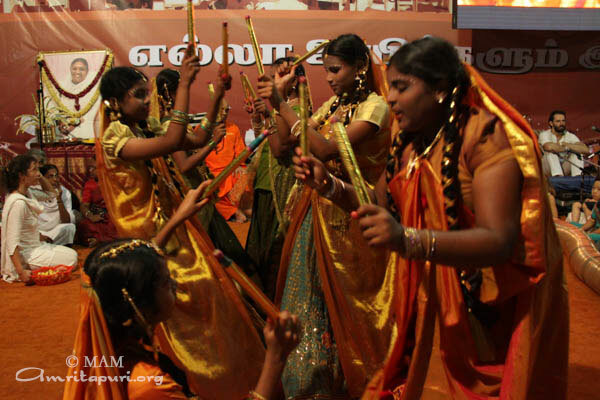 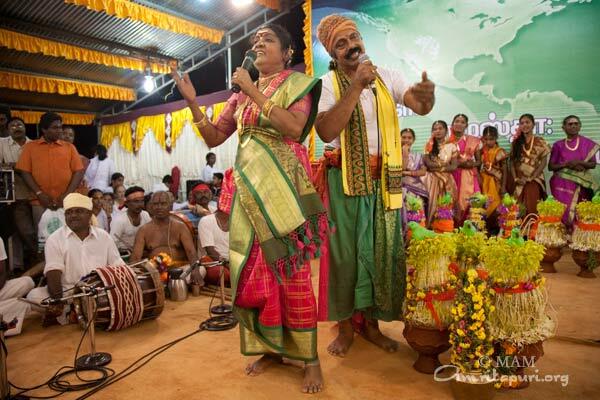 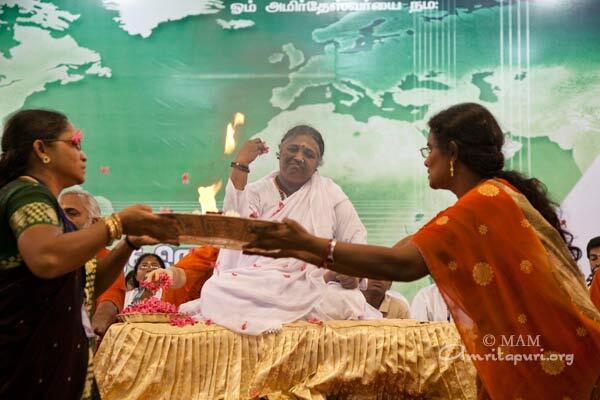 Organizers of Amma’s programs are typically preoccupied by the same question. 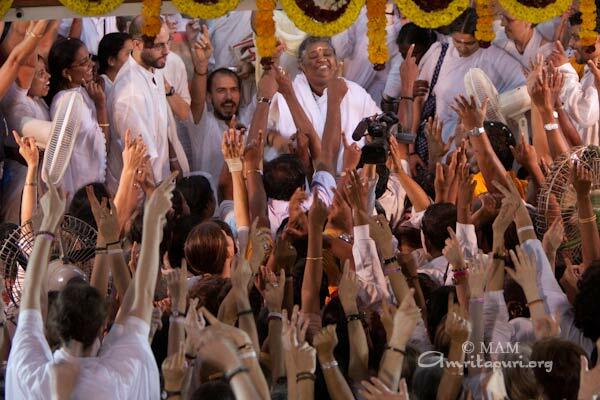 The question is always “Where?” Where we can we fit all these people? 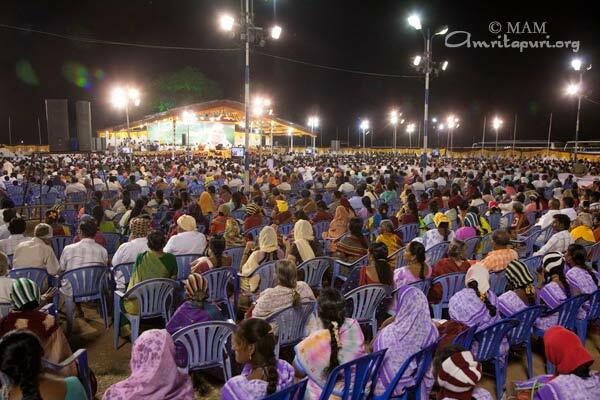 Because Amma’s programs never get smaller. 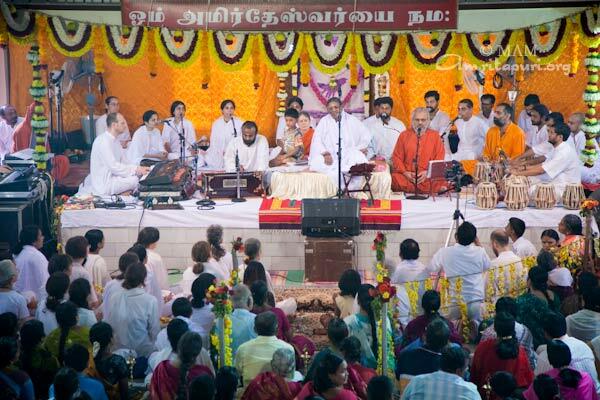 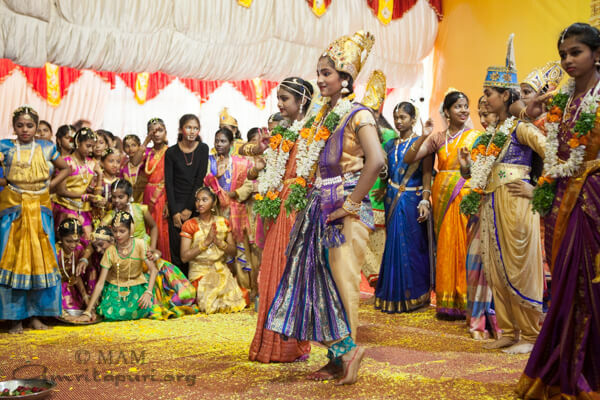 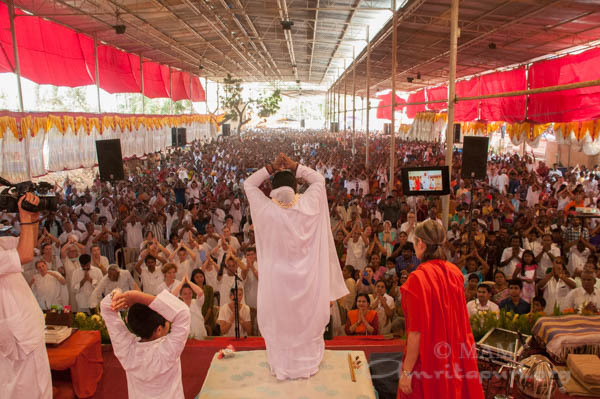 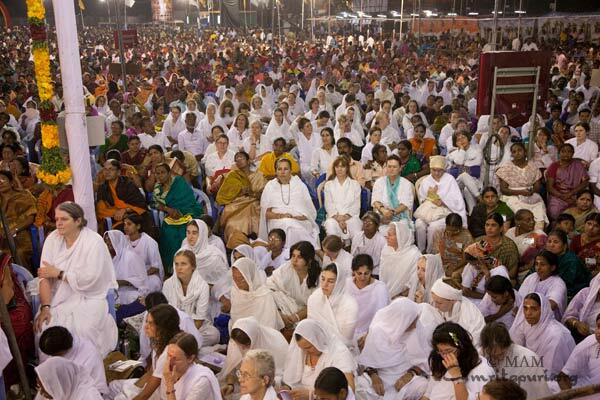 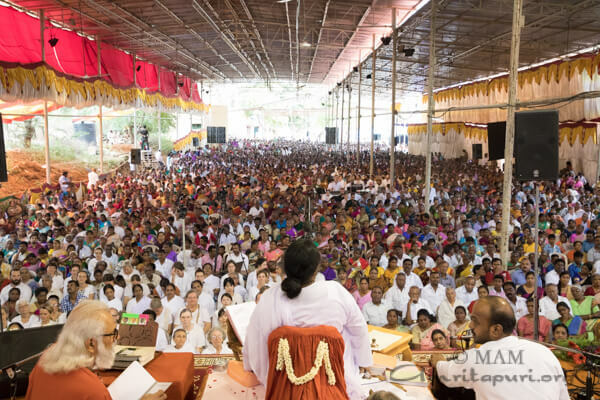 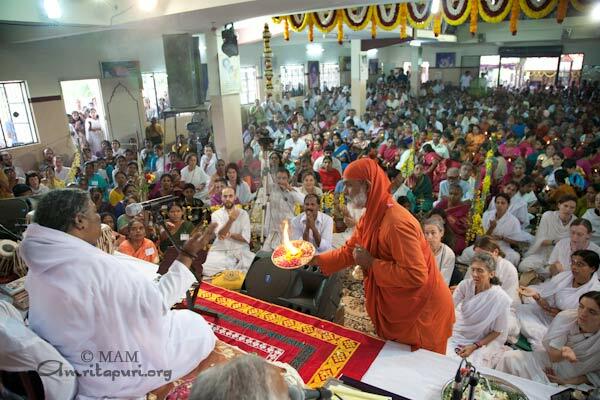 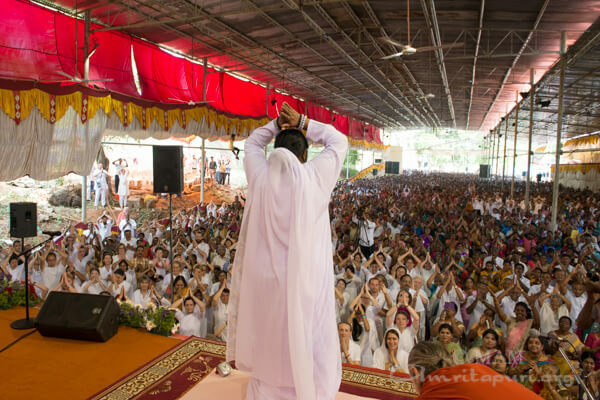 And no matter the size of your venue, Amma’s program will ultimately outgrow it. 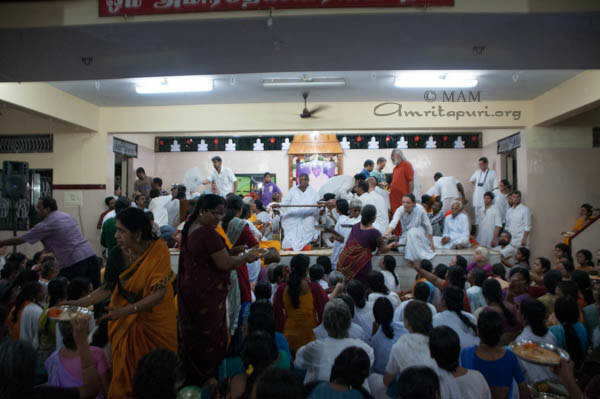 Recognizing that Amma’s following has long since outgrown the capacity of the Madurai Ashram’s prayer hall, the local devotees came up with a unique, outside-the-box solution to this ever-present challenge – they realized that the hall was far too small. 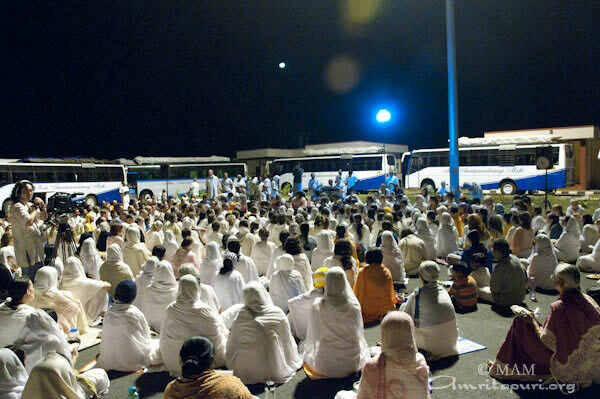 But just behind the ashram, just near the Brahmasthanam Temple, was nice, wide access road. 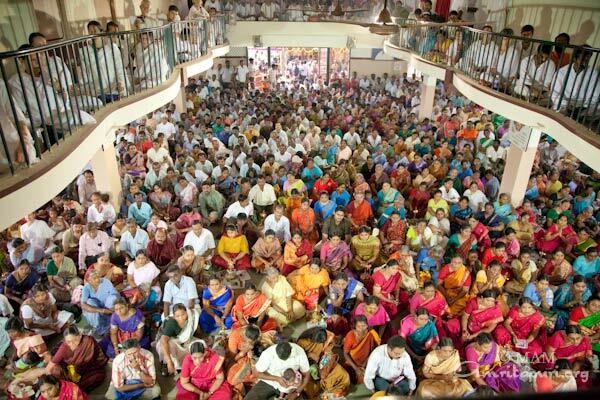 So, they approached the local government authorities, and requested permission to borrow the road for two days. 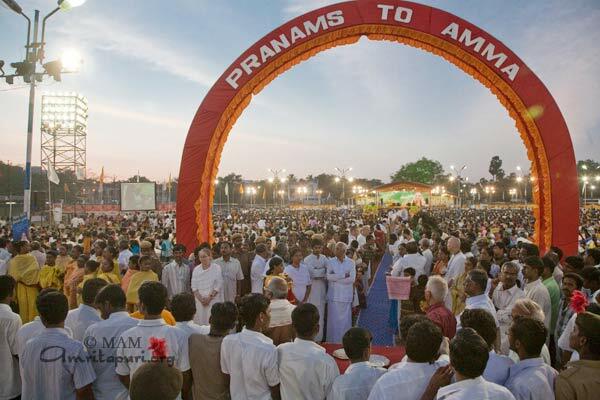 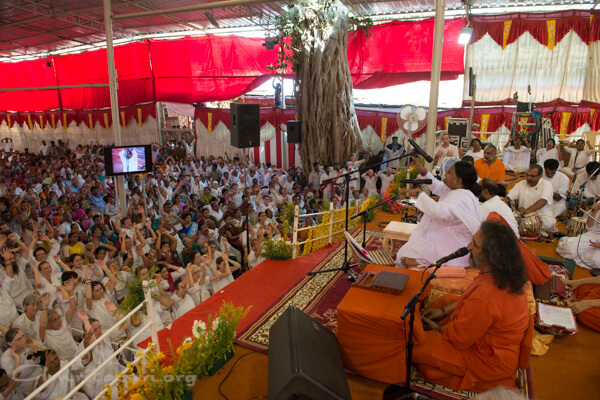 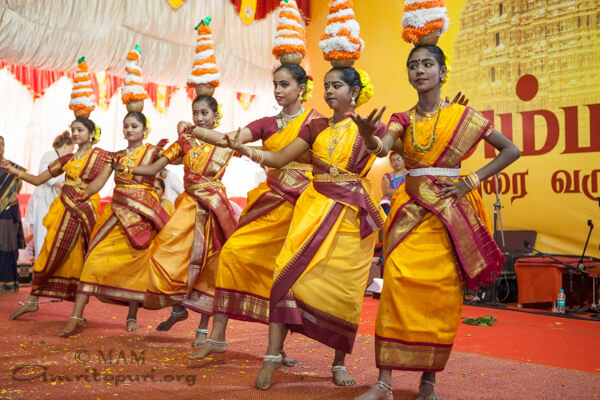 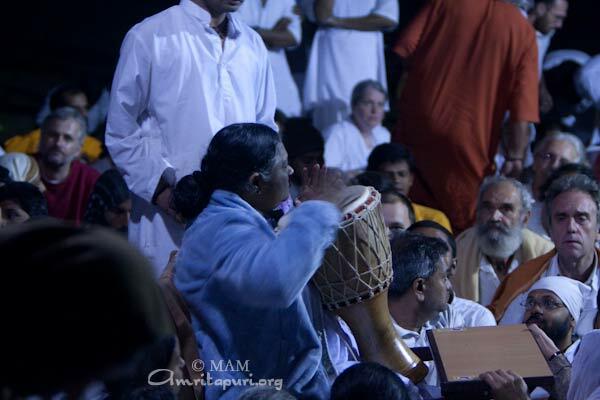 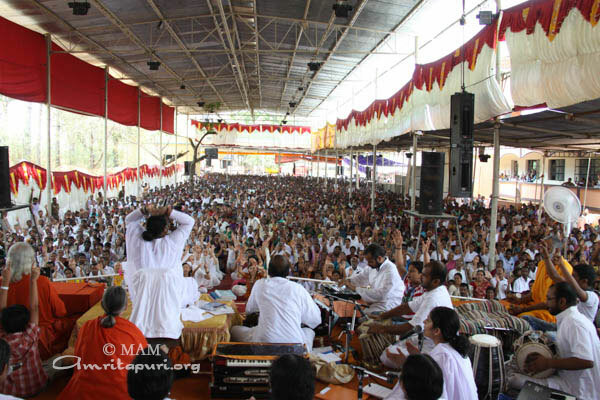 Permission was granted, and a large pandal was constructed over the road itself – proving once again that wherever Amma holds a program becomes a temple; it becomes hallowed ground. 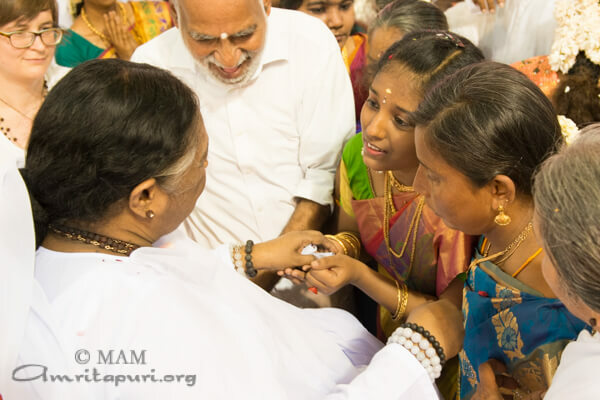 Amma, too, found a way to be sure that the original temple hall was still blessed by her presence – on the evening of her arrival, she served Prasad, sang bhajans and shared a satsang from inside the original hall. 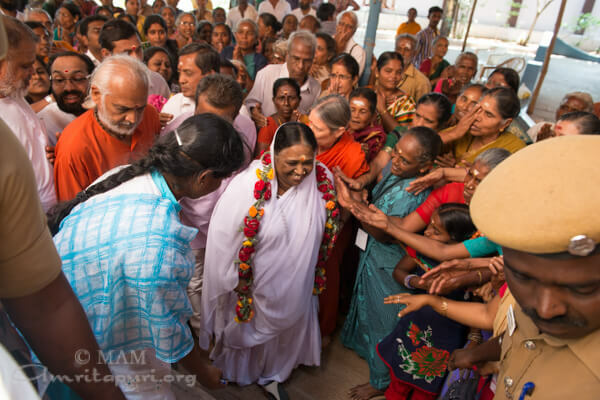 When it overflowed with people, she invited them up onto the balcony overlooking the hall, so that everyone could share time inside the prayer hall with Amma in a more informal setting. 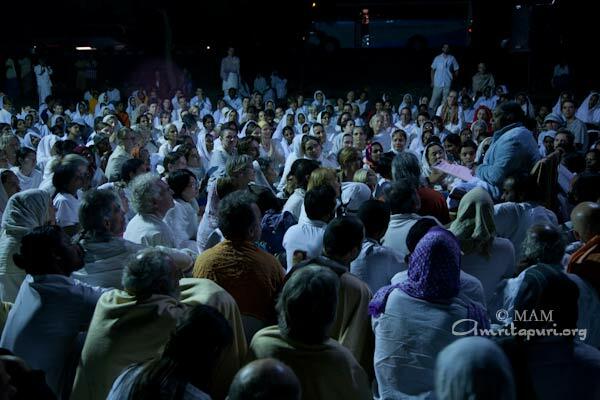 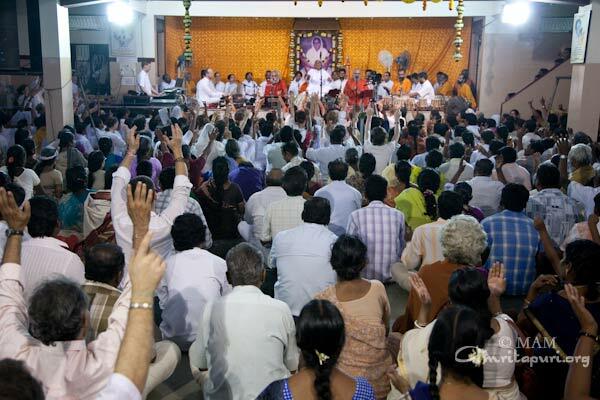 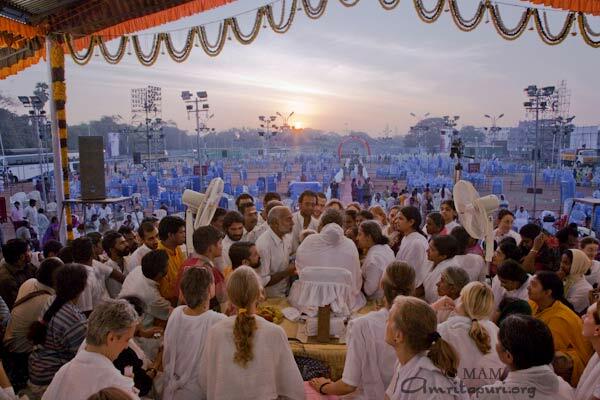 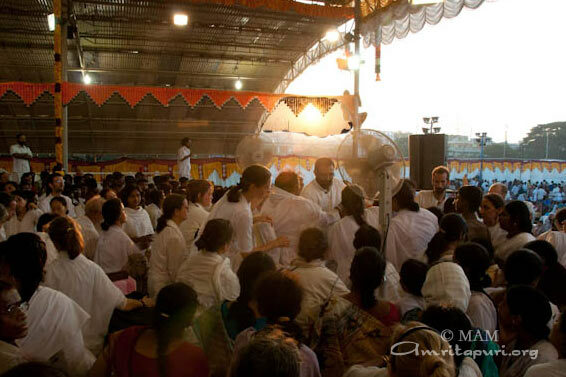 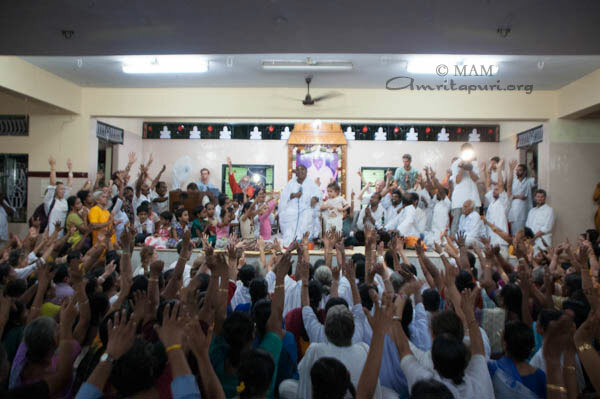 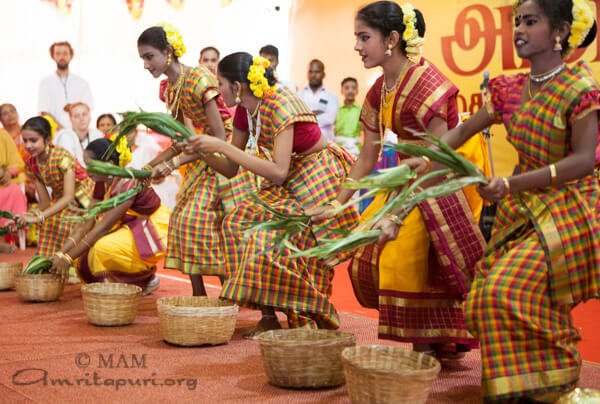 Each time Amma arrives at a city on this tour, she has been hosting these informal gatherings with her children. 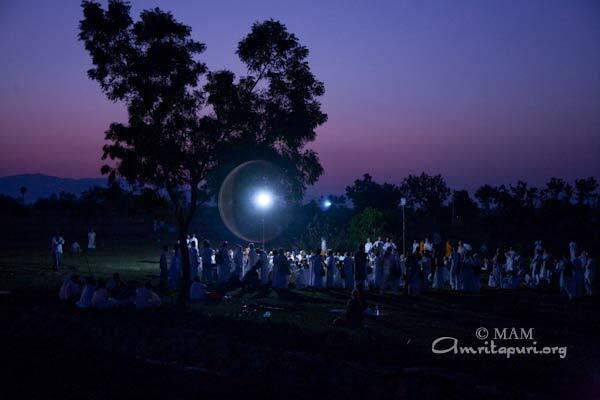 They have the flavour of a family get-together, and ultimately, that’s what they are; a mother gathering her flock. 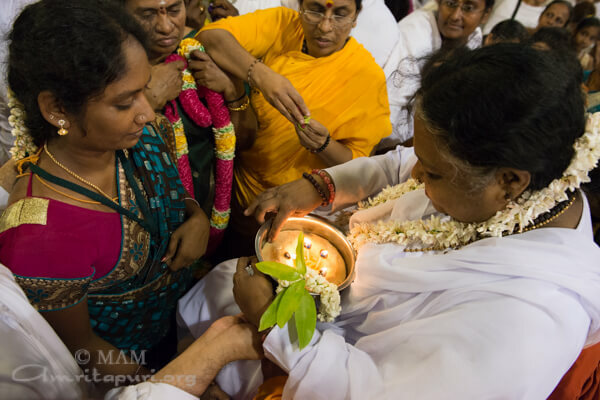 That evening, after serving prasad to her children, Amma started singing a bhajan. 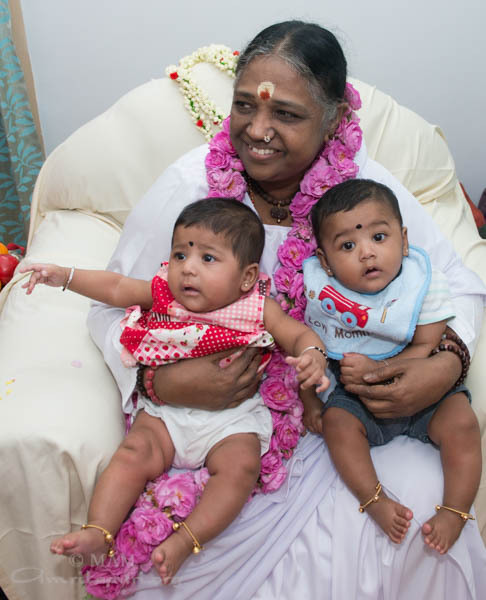 Just then two cute toddlers came to Amma and started dancing in front of her. 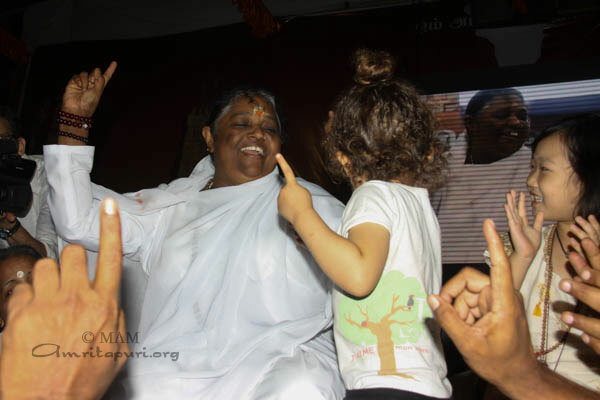 Then, mid-dance, one of the children began to try to climb up into Amma’s lap. 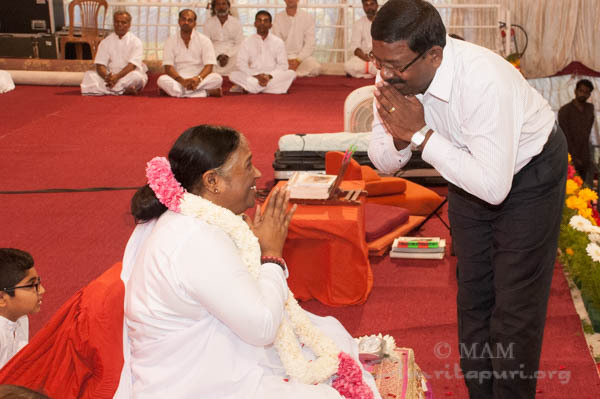 Amma was sitting on a chair, so it was not easy for him to climb up. 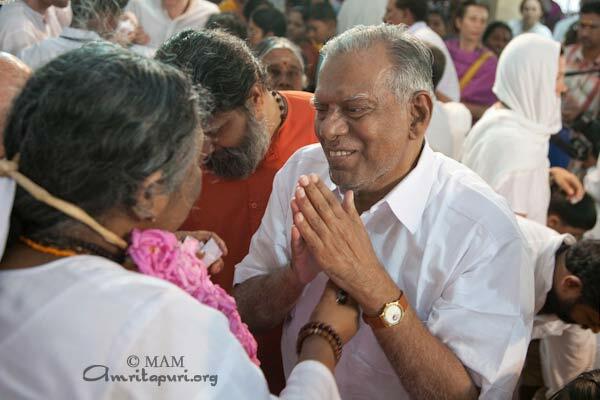 Slowly but surely, though, he made his way on to her lap. 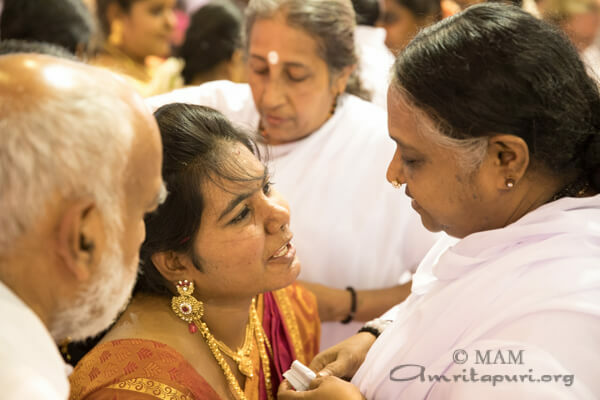 Seeing him perched in Amma’s lap, the other toddler started climbing up as well. 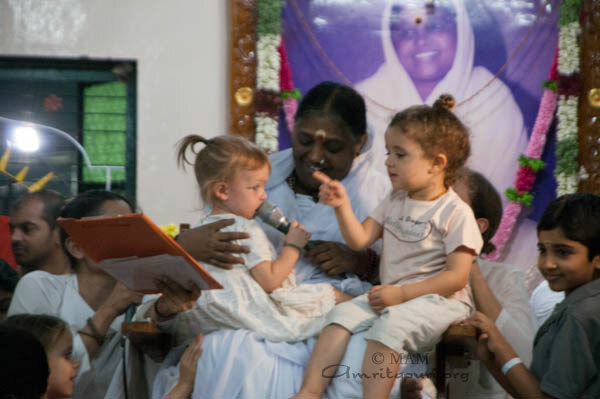 Amma started laughing along with all the others, and continued to sing uninterrupted.. once the second toddlers had also made her way onto Amma’s lap, Amma started sharing her mic with the little ones – it was a touching, multi-layered sight, carrying reflections of innocence, Amma’s ability to keep multi-task naturally and joyfully, and simultaneous awaken devotion in the hearts of all. 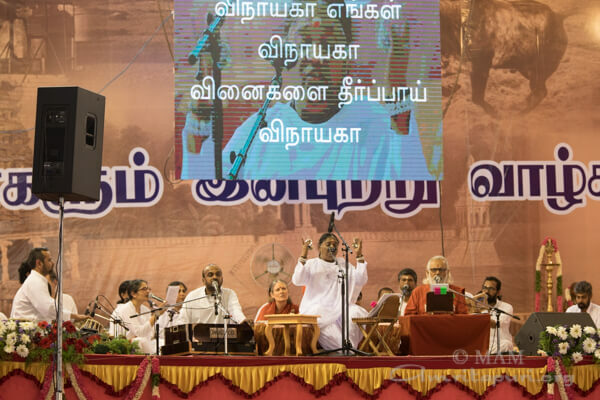 The two days of programs in Madurai ended after midnight on the second day with Amma singing ‘Elappula elo’, to the delight of all her gathered children. 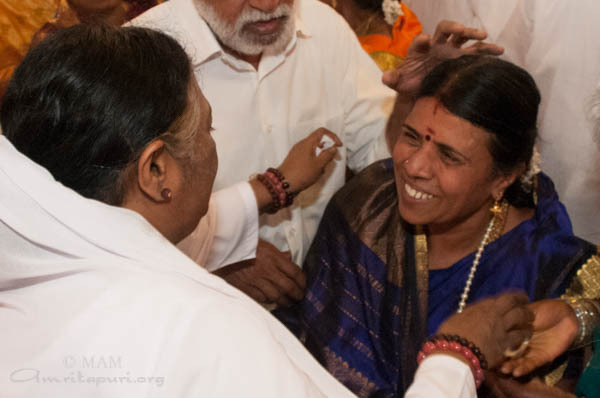 Joy and peace permeated the air in the temple on the road. 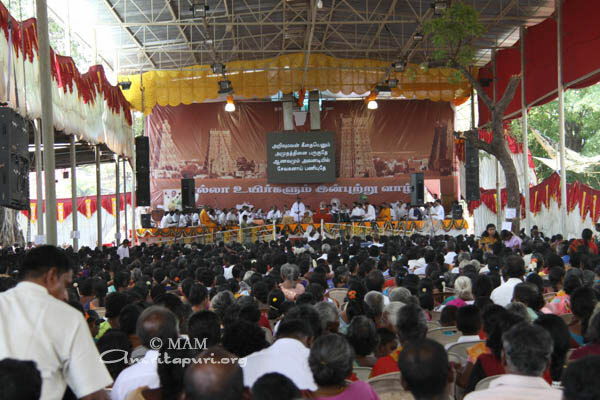 Madurai is a temple city, home to some remarkable temples including the famous Meenakshi temple. 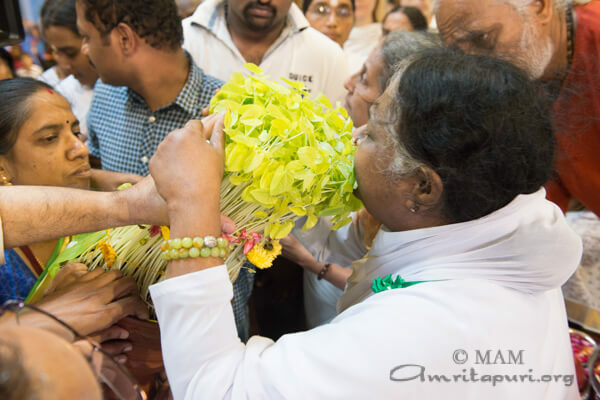 Amma has been paying visits to this city since she was a young girl, even before she began publicly giving darshan. 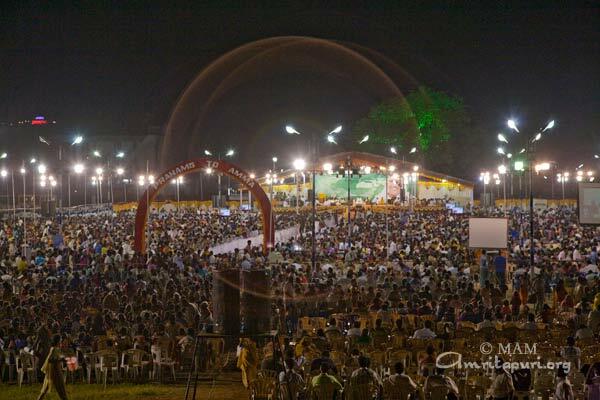 Today Amma once again returned to Madurai and gave a public program that filled the Madurai College Grounds to their capacity. 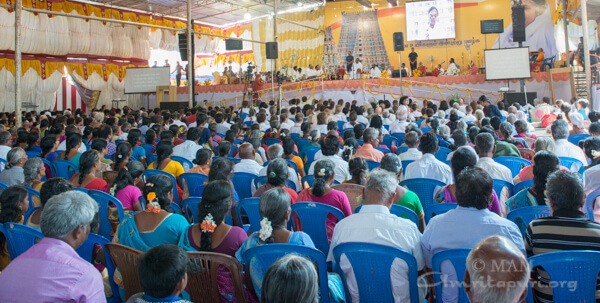 Hours before the start of the program people streamed into the venue, waiting patiently to ensure themselves good seats for Amma’s satsang, bhajans, meditation and darshan. 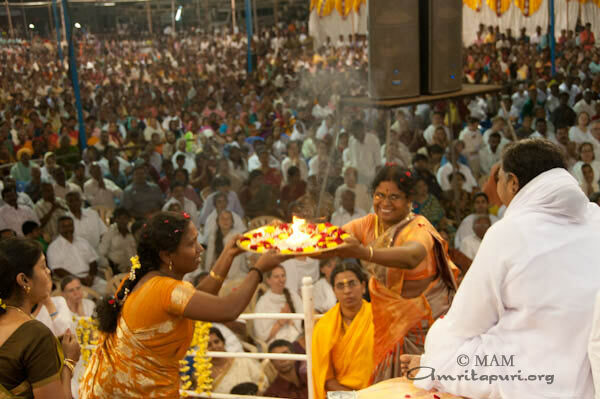 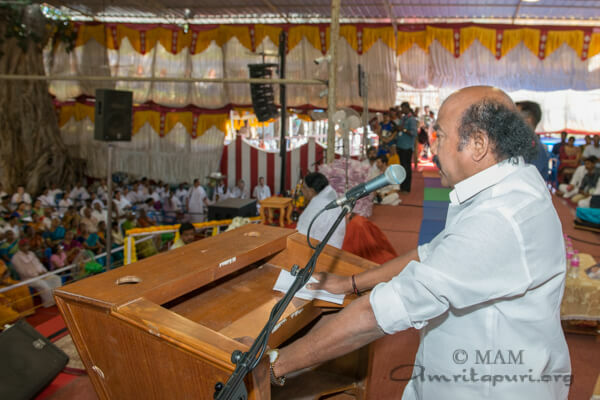 By the time Amma arrived on the stage the massive venue was overflowing with people. Chitra Venkataraman – Chief Justice, Chennai High Court; Thenmozhi Gopinathan – Mayor, Madurai; SS Krishna Murthi IPS – IG South Tamil Nadu and Swami Paramananda from Vivekananda College were amongst the honorable guests welcoming Amma. 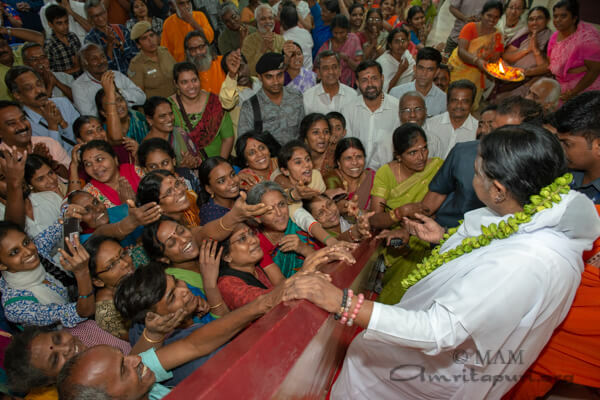 Welcoming Amma to the city, Chitra Venkataraman, the Chief Justice, said “There is a special feature that is attributed to goddess Meenakshi, the deity presiding over this city. 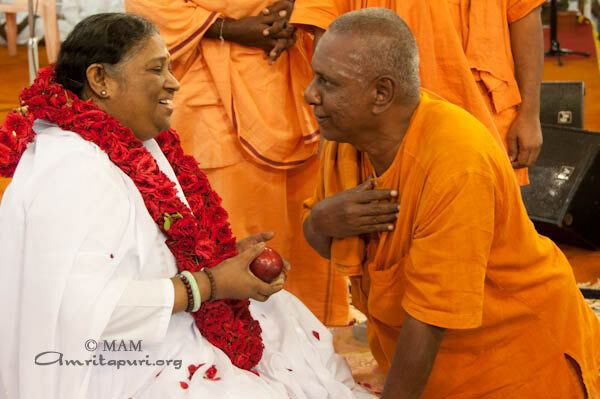 A fish will always watch over it’s children without even blinking the eye. 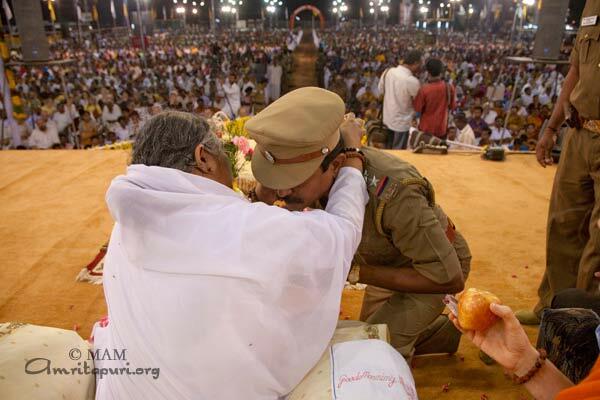 Likewise, the Meenakshi of this city continuously blesses people, without the slightest break or hesitation. 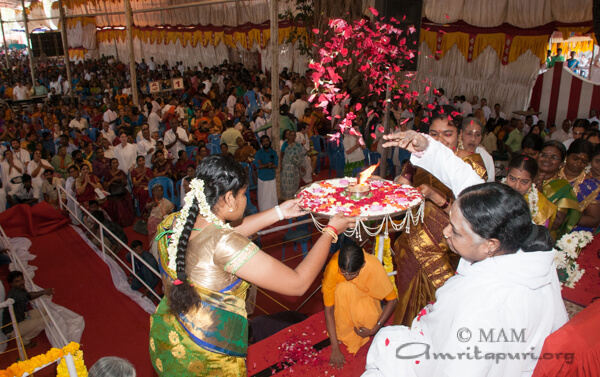 We all see the incarnation of goddess Meenakshi right in front of us now. 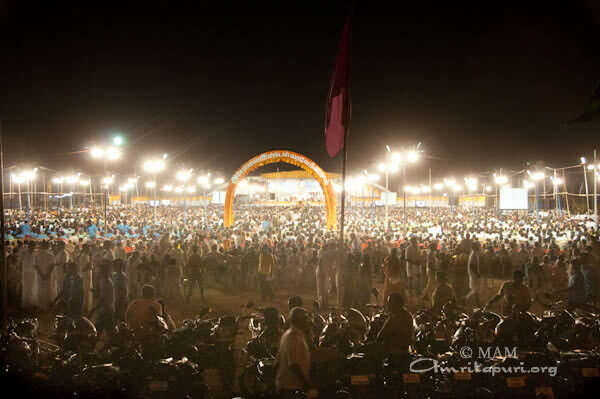 Just by the glance of her eyes she is able to embrace all the thousands of people gathered here. 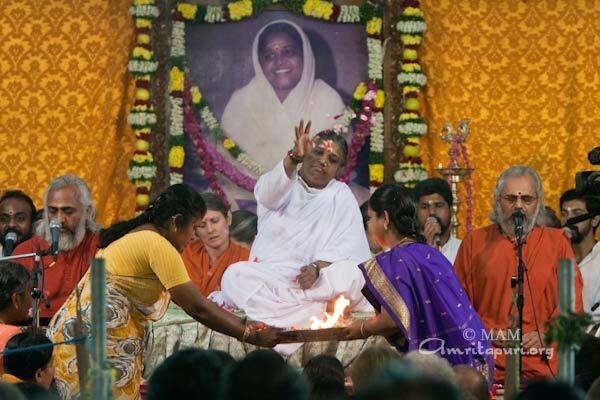 This is the greatness of the divine mother. 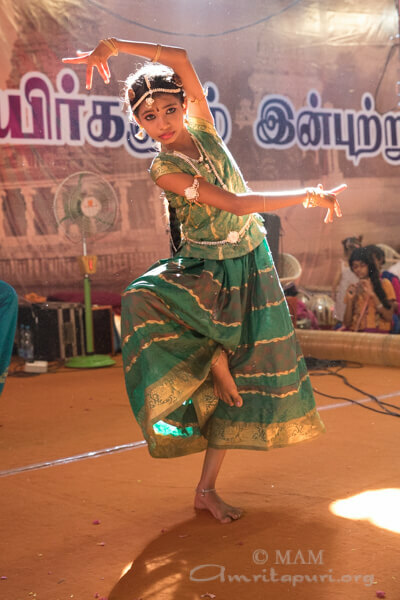 Not everyone can do this, definitely not. 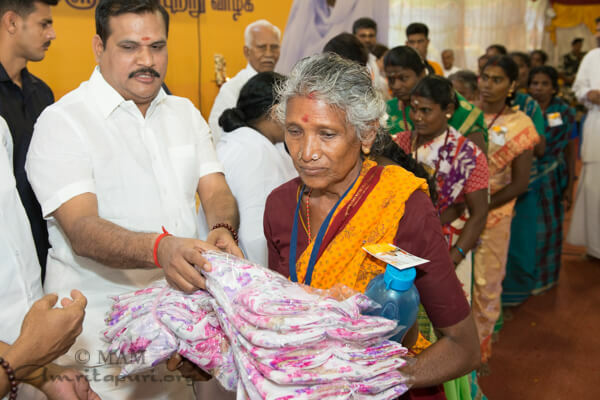 During the public function Amma gave out handkerchieves to students in order to spread awareness about the ABC Initiative for cleanliness and public health. 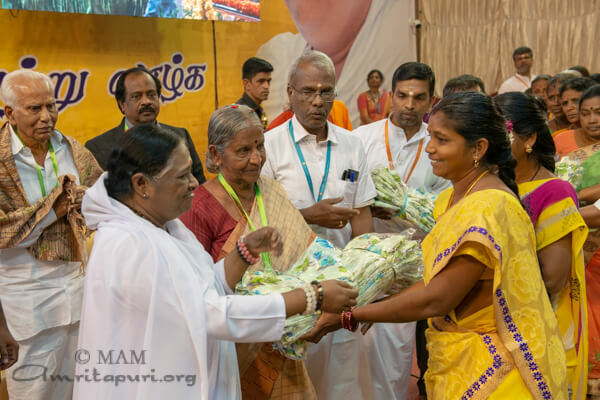 Chitra Venkataraman helped Amma to distribute the handkerchieves on the stage. 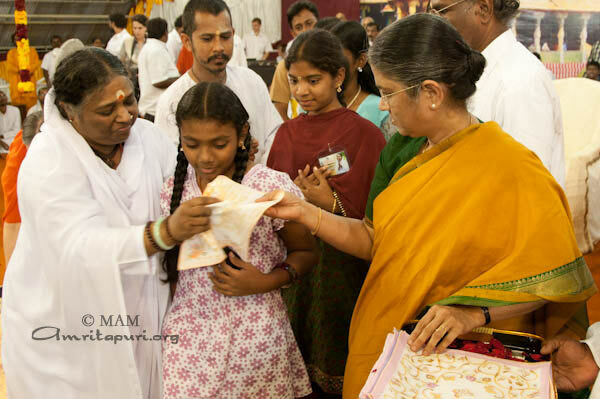 Later during darshan Amma gave away these handkerchieves to all the youngsters and students. 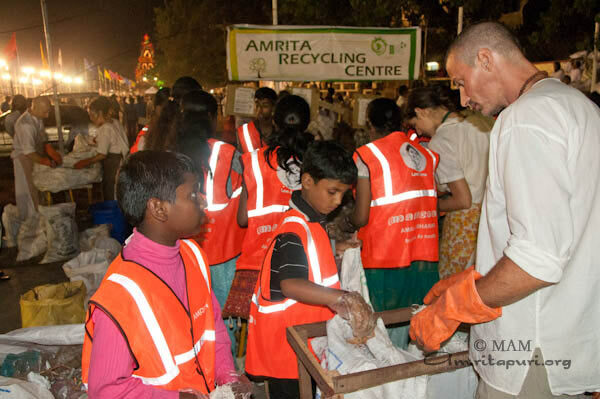 Recycling stations were set up all over the venue, which were operated by both Westerners and Indians, young and old alike. 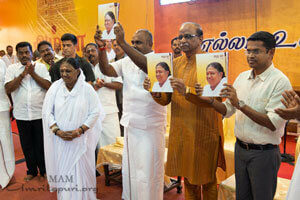 The aim of this campaign is to encourage people not to litter on the road and help them sort and separate the waste. 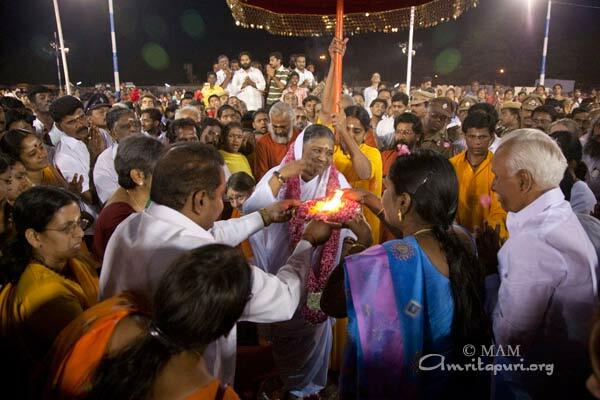 People were waiting all throughout the cold and windy night to be embraced by Amma’s eyes and arms. 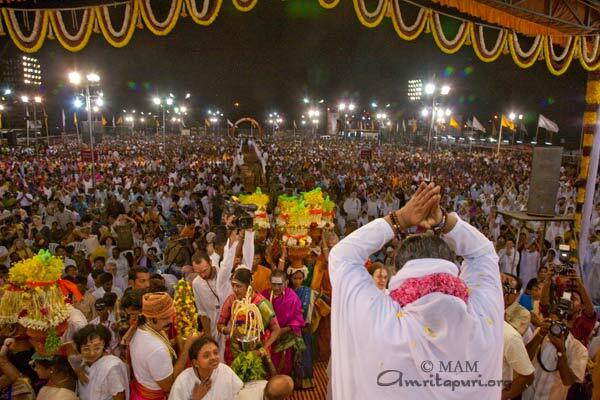 At 8’o clock, thousands were still waiting for Amma’s Darshan. 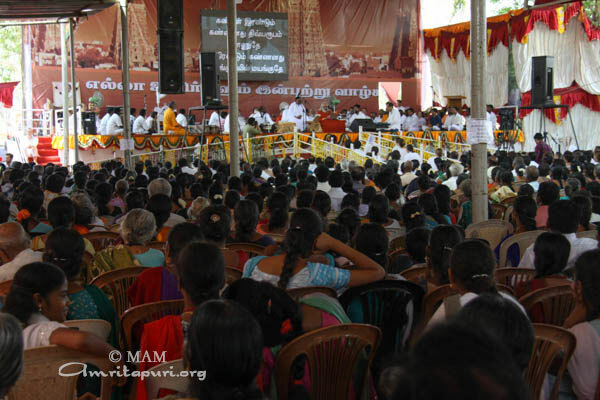 Amma asked on the mic to the volunteers, to move the queue to the shade so they will not have to wait in the sun. 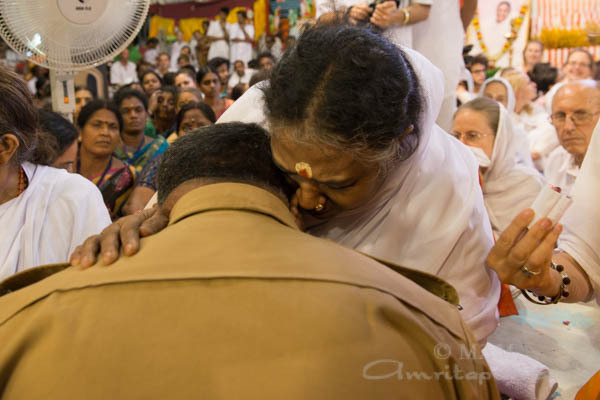 It took another two more hours for Amma to embracing all those came at Madurai. 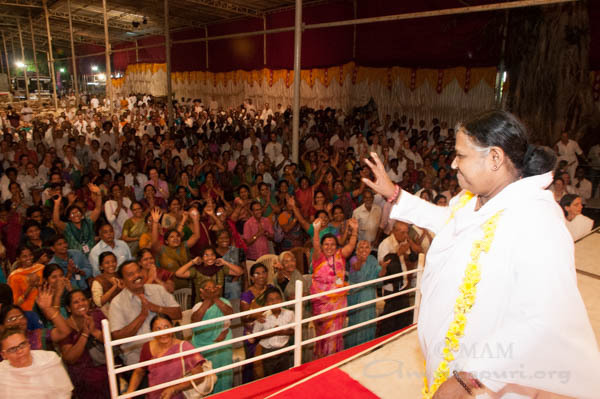 24 Jan, Madurai, Bharata Yatra 2009.